If any drummer could be considered a "natural" it would be Stan Levey. What else would you call a 16 year old kid who never had a formal drum lesson yet was good enough to work with Dizzy Gillespie? Dizzy himself referred to Levey as the "Original Original" because he was the first drummer that Dizzy liked. While this documentary DVD covers Stan Levey's drumming career in detail, it will also be of interest to anyone who's into bebop or modern jazz music. Let's check it out. 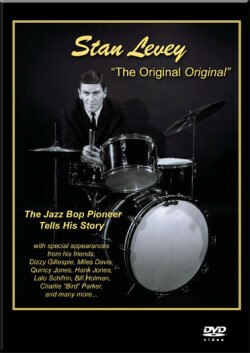 The DVD consists of interviews with Stan Levey and recollections from many of Stan's friends and colleagues including Dizzy Gillespie, Miles Davis, Charlie Watts, Quincy Jones, Hank Jones, Bill Holman, Lee Konitz, Howard Rumsey, Terry Gibbs, Bill Henderson, Lalo Schifrin, Charlie "Bird" Parker himself, and many more. While the interviews are the main thrust of this DVD, there are some brief audio and video clips of Stan's performances interspersed throughout. Beginnings of Bop: Stan explains how he started out in drumming by placing the bass drum of a toy drumset (given to him by his parents when he was 7) against the radio and playing along with the hit songs of the day. According to Stan "I'm a very lucky man. My first professional job as a drummer was at the age of 16 with Dizzy Gillespie. How lucky can a guy get? A white kid out of Philadelphia with no experience, no drum lessons, and no drums! But it was all built-in. I had the sound and I could do it." Stan discusses his gig with Benny Goodman, who had the number one band in the country at the time, explaining that he got it despite the fact that he had no big band experience and didn't own a set of drums! We follow Stan's career through his move to New York City, his first recording (with Art Tatum, no less), work with pianist Erroll Garner, and Charlie Parker, who Stan says was amazing. "Musically far ahead of everybody else." Levey and Parker got along so well, personally and musically, that they started a band togther and roomed together in Harlem. Stan recalls that among the occupants of his building were "Billie Holiday, Sarah Vaughn, and Freddie Webster. It was kind of a musical enclave and some good music came out of that." Playing with Kenton: Stan speaks candidly about a narcotics violation and discusses his work with the Stan Kenton band, which didn't impress Levey much at first. According to Levey, it seemed like a "stiff West Coast Band in my estimation. I didn't really like it." When the band started playing new arrangements by Bill Holman, they made a better impression on Stan and when Kenton offered him the drummer's chair, he took it. Stan, who couldn't read music when he joined the band, learned to read while working with them. Of Stan Kenton himself, trumpeter Jack Sheldon says that Kenton was always pushing his horn players harder and harder to the point of exhaustion. According to Sheldon, "Stan Kenton held the record for sidemen suicides!" West Coast Cool: This chapter covers Stan's career on the West Coast starting with replacing drummer Max Roach in Howard Rumsey's Lighthouse All-Stars Band, a gig that lasted for five years, through his recording work with the best in the business. Drummer John Guerin recalls "Stan was so beautiful to me. He invited me over his house and I spent the night. He let me sit in with the Lighthouse All-Stars, and mentored my whole week there. I was so fortunate to have that kind of man give me his time at that time in my life." In contrast to Stan's actual gentle personality is drummer Jim Keltner's early impression of him "When I was very young, when I first saw him play, he intimidated me. I thought that he was a scary guy. I would never want to go up and talk to him." Vibraphonist Charlie Shoemake describes Stan's physical appearance as "very intimidating. Here was this big guy - everybody knew that he had been a good professional fighter - and he looked like he could take you out in five seconds or less!" Trumpeter Jack Sheldon adds "It was always great to have Stan in the band. Nobody ever fooled with the band and we always got paid. Stan never had to do anything, he would just stand in the corner and make a face!" On the five years he worked at the Lighthouse with Howard Rumsey's All-Stars, Stan recalls "We had great customers that came in including actors Lee Marvin and Marlon Brando, everybody. Liberace came in, he liked jazz. It was fun. It was just a great place. We did an all day concert on Sunday from 2:00 in the afternoon until 2 in the morning." Stan on cymbals: "When I was with Stan Kenton, 1952 through 1954, it was a good band but very loud. The Zildjian company sent me all the cymbals that I needed and I used big 22 and 24 inch cymbals. Unfortunately, I use to break about 6 to 8 cymbals per year, that's how loud I was playing. When I left the band, the Zildjian company was very happy that I went into quieter work!" Stan on drum gear: "In the years that I played, we used very minimal equipment - bass drum, snare drum, one or two tom toms, a ride cymbal, a hi-hat, and maybe a small cut cymbal. Another company that sponsored me was the William F. Ludwig company. They would send me two or three sets a year and they were very generous to me. Sticks and anything I needed, they would just send it right out to me on the road. To me they were the best drums, they had the best wood. I used Ludwig all through my career." The DVD also includes Stan's tips on the differences between playing drums with big bands versus small groups. Stan's Bio and Selected Discography are also included on the DVD. If you are looking for a DVD that shows Stan Levey playing with some of the greatest musicians of all time, you'll be disappointed. Although we are given a taste of Stan performing via brief audio and video clips throughout, this DVD is mainly a documentary consisting of interviews with Stan and some of his famous friends. However, this DVD represents the career of one of the most important players of his time and a true pioneer in the art of Jazz Bop drumming. The day I received my review copy I intended to sample it for just a "'few" minutes and review it later in detail. Before I realized it, I had watched the entire DVD! The Bottom Line is that I feel this documentary DVD should be on every drummer's list, regardless of drumming style. To know where you're heading, you must first research where you came from! I recommend it. Buy Stan Levey "The Original Original"